The item featured here is an authentic World War One U.S. M1910 Haversack. 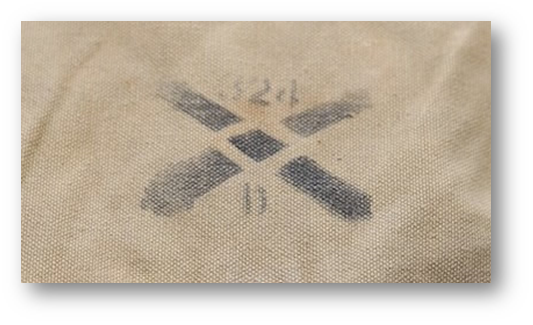 Has clear artillery unit stencil on the flap, Battery D, 324th Field Artillery insignia with trooper number 33 stenciled below. This US Army WW1 Early Khaki M-1910 Haversack is in excellent condition, with a bold "US" marking at front. The pack is dated "12-17" (December 1917) and marked with its manufacturer's name "LONG" witch stand for R.H. Long Company. The lace-on meatcan pouch and pack tail are not included. This is a great unit ID'd early green canvas haversack. 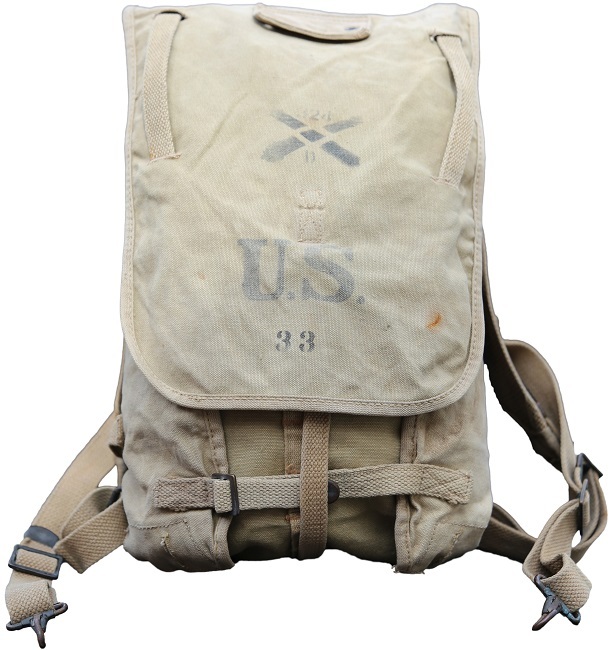 The US Army issued the M-1910 haversack early in the 20th Century, and it was a precedent for field pack design for years to come. It was intended to carry a soldier's bedroll, clothing, and personal equipment. It was a "roll" type pack, which could be expanded or contracted depending on the combat load. This example is a Post-1916 manufactured M1910 haversack in khaki canvas. The two blackened brass grommets in the center of the pack are for an entrenching tool to be hung. The meat can pouch is attached over the entrenching tool using straps through the four visible slits on each side of the pack. On the top left side of the pack are two more grommets used for attaching the bayonet. The M1910 haversack had straps that went around the shoulders and hooked to the side of the pack. The other two straps went straight down and attached to the belt. The M1910 pack was very awkward, yet it was rugged, and if packed correctly, could carry all of the soldier's gear. The M1910 pack was manufactured in olive drab until the end of 1916.